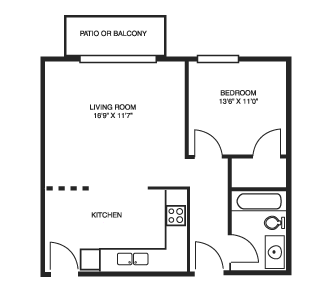 Every unit in Brentwood apartments includes 1 Bedroom and 1 Bathroom, with 650 total square feet. Rent is $999 per month. As you can see from this floor plan, each apartment has a full living room, a fully-furnished kitchen, a luxurious bedroom, and a patio or balcony. For more information, please call us at 630-860-0243.